I’m greeted by the waft of a gentle yeasty scent, more bread-like than boozy. The entry leads into a warm and welcoming tasting room that has the demeanor of a bright and cheery pub. A wooden bar flanked by tasting menus dominated the room, and several tall tables and stools are scattered throughout the space. Sonja approached me with a big grin and a warm handshake; she is more scholar than mad scientist or industrial worker, and I relaxed. I asked how she and her husband, Derek, found themselves together on this path. She told me, “We met on a gaming BBS called Outer Limits in Denver, Colo. I was a math major and we were introduced by a mutual friend because Derek was looking for math help. Two and a half months later, we got married. We have a bit of an impulsive streak, once we decide to do something!” They’ve been married for 22 years now. 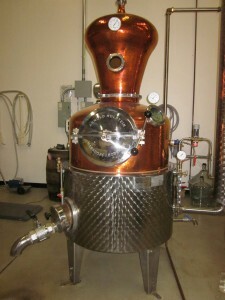 In 2003, Derek started to research the idea of distilling his own spirits, and the company was formed on October 1, 2004. They ordered their still from a custom manufacturer in Germany, and it arrived in early 2005. Sonja quit her job that July. They spent the summer refining their recipes, and their first sales were in October of 2005. The still (her name is Ethel) arrived in a huge wooden crate, in three pieces, with no instructions, other than a few notes in German – a language which neither Kassebaum speaks. But Derek had visited Germany to inspect the still at the factory, and he was able to figure out how to put it together himself. “He’s handy to have around,” Sonja said. ”You can only distill water before you have a license,” Sonja explained. “When we applied (for a license), there were only a few craft distilleries out there: 60 in the U.S. But after 10 years, it’s up to 600. It’s an interesting time to be in the business. We were the first craft distillery in Illinois.” There are 20 now, and five more due online in the next six to nine months. Sonja knows this because she’s the secretary of the newly minted Illinois Craft Distillers Association. This is a marked change from pre-Prohibition (1920-1933) days, when, Sonja said, there were 1,000 distilleries in Kentucky alone. “There used to be local spirit producers everywhere. It was part of the fabric of our country,” she said. She likens the distilleries of the past to the modern locavore movement; each area had its own specialties and products. 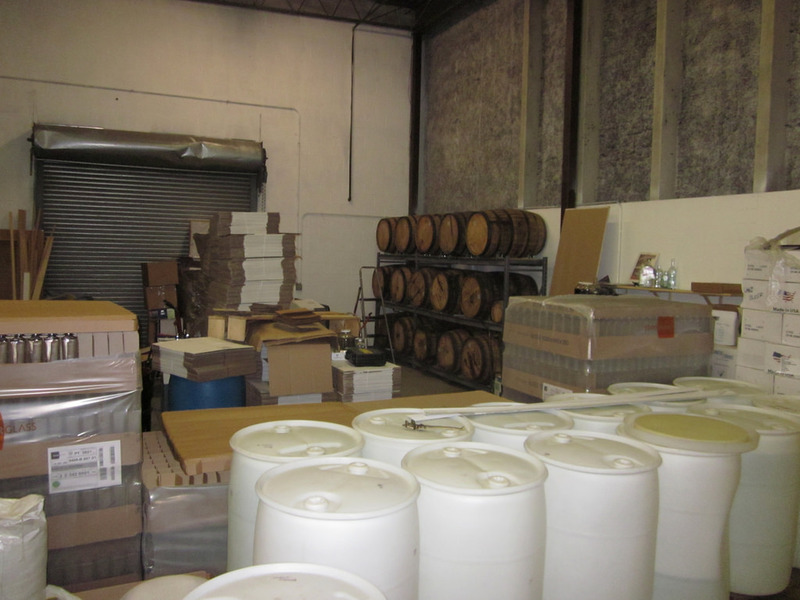 All the herbs in North Shore Distillery’s products are organic and wild-harvested, and the Kassebaums needed to be certain that their sources were consistent and reliable. For No. 6, “We knew we wanted a bright citrus note, and used fresh lemon peel for that. Gin must have juniper to be gin. We tried junipers from all over the world, and found the domestic ones to be bitter and medicinal. We settled on an Eastern European juniper. We wanted some detectable spike tones, and used cardamom, coriander and cinnamon. We got a floral note with lavender. It’s just like developing any other recipe,” she said. She brought over a little bottle of whitish woody chips, and explained that it was orris root, the root of an iris. It’s used in gin and perfume, as a base note for the middle and top notes to balance against – but if you use too much, it tastes like dirt. “We definitely made some things that were deliberately disgusting. We’ve got to be sure we know the difference so we don’t put out anything gross. That’s part of the fun!” she said. I asked if they used any local products, and she said, “We do when it makes sense. For instance, Nielsen-Massey Vanilla in Waukegan is the best vanilla out there.” They also use local produce, herbs, and syrups in their cocktails. Sometimes they make a single-batch spirit (the next one is due out this month, but it’s a big secret and no amount of wheedling garnered even a hint). Past single-batch flavors have included Ceylon tea, medjool dates, rhubarb, mango, molé poblano, and Silver Lining, a coffee-chocolate Kräuter liqueur (a German herbal liqueur better known as Jaegermeister – “We make Jaeger for grown-ups!” Sonja quipped). She started with the gins. North Shore Distillery’s flagship product is the Distiller’s Gin No. 6, what Derek and Sonja consider their modern gin, aromatic and complex with flavors of juniper, citrus, spice and floral notes. It’s the highest-rated American-made gin, and received 95 points from the Beverage Testing Institute. When I asked about the almost creamy mouthfeel, she explained that the essential oils from the herbs give body and texture to the spirits. This is why this gin felt smoother to me than the next two, because No. 6 had more of those herbs. “Some spirits have additives to change the texture. Not us!” Sonja said. Distiller’s Gin No. 11 is their classic London dry gin, with more juniper. This one is better for the “old school” or savory cocktails, with less spice and no floral, Sonya told me. She also poured me a little of their Mighty Gin, a high-proof version of No. 6, with a flavor between No. 6 and No. 11; there’s more juniper but still a whiff of the florals, as well. I sampled the straight North Shore Vodka (which tasted clean and smooth to me), the Sol Chamomile Citrus Vodka (fruity and light but not sweet), and the Tahitian Vanilla Vodka, which is currently only sold in the distillery’s tasting room (it’s creamy and slightly floral, with just the slightest touch of sweetness). Sonja said that it’s the only product they make that includes sugar, to extend the finish. Aquavit–Private Reserve is poured ice cold, straight from the freezer. This product is probably why I asked for this particular writing assignment, and I’m happy to report that it’s still as spicy and savory as when I first tried it a year ago. There are hints of caraway and cumin and anise, with a depth that comes from aging in oak barrels. “It’s something we love. Scandinavian friends introduced us to it,” Sonja said. Sirène Absinthe Verte is 120-proof and not meant to be drunk straight. Louche is the pale green turbulence or cloudiness that characteristically appears in absinthe when water is added, and Sonja was good at showing it off for me. Anise seed and fennel make it grassy and fresh, and the bitter wormwood is only a supporting player instead of hamming it up across the palate. It’s very herbal and complex. I liked it, and I don’t like absinthe; I may have to revisit my opinion. Which one does Sonja like the best? She feigned horror when I asked. “We like them all! We only make things we like. That’s like asking us to pick a favorite child!” she said. 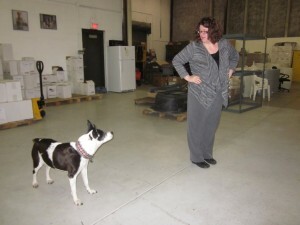 Now that I was properly warmed up, we moved into the production area where we met Sunshine, the distillery dog. Sunshine rose to greet us, and happily accompanied us on the rest of our tour. Ethel, the North Shore still, commands your attention as soon as you walk into the big open area of the production floor. I’m a little surprised at how small she looked at maybe eight feet tall, considering she cranks out enough booze to supply several states with NSD products. She has a beautiful purplish patina over her gleaming copper dome, which was hand-hammered and shows no sign of a seam. “We give Ethyl a spa day periodically – a good cleaning and a polish,” Sonya said. Here’s a quick introduction to the distilling process: Soaked grains (such as corn, barley, or rye) begin to sprout, which converts their stored starch into sugars. 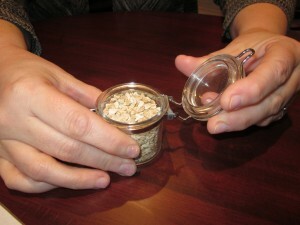 This sprouted grain is dried, crushed, and soaked in warm water with yeast (now you have “mash”). The yeast digests the sugar, which produces alcohol (this is fermentation). At this point, you have “wash” or “sour mash,” which is basically unhopped beer. The point of distilling is to concentrate and purify the alcohol out of this mess. This is where Ethel comes in. 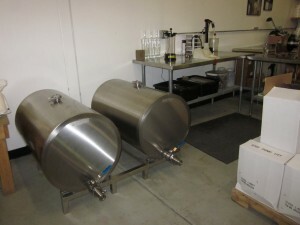 Once she is filled up, the water jacket circulates warm water that slowly heats, causing the alcohol to become vapor that rises to the top of the still. This vapor is carried out via a pipe through a condenser, which cools that vapor back into a liquid and drains it into big glass carboys (those giant jugs that look like water cooler bottles). 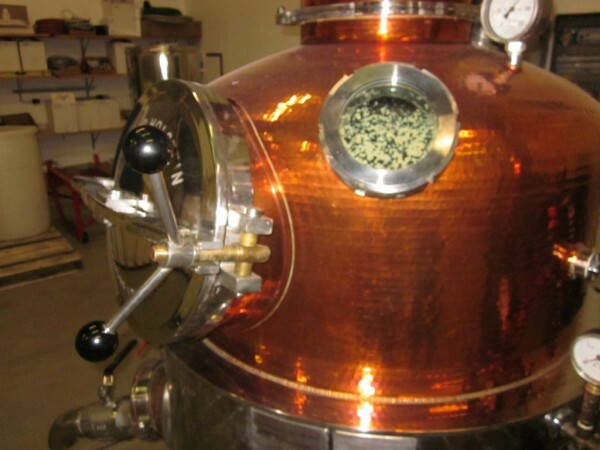 The initial distilling product is called the “heads,” and it is not anywhere ready for prime time. “It tastes and smells bad. There’s methanol, things you don’t want in there,” Sonja said, grimacing. As the temperature rises, you get to the “hearts,” the good stuff, eventually ending up at the “tails,” which are quite alcoholic and full of fusol oils (undesirable volatile liquids). As the flavors change during distillation, the Kassebaums use Mason jars to taste the flavor of a new product throughout the process. 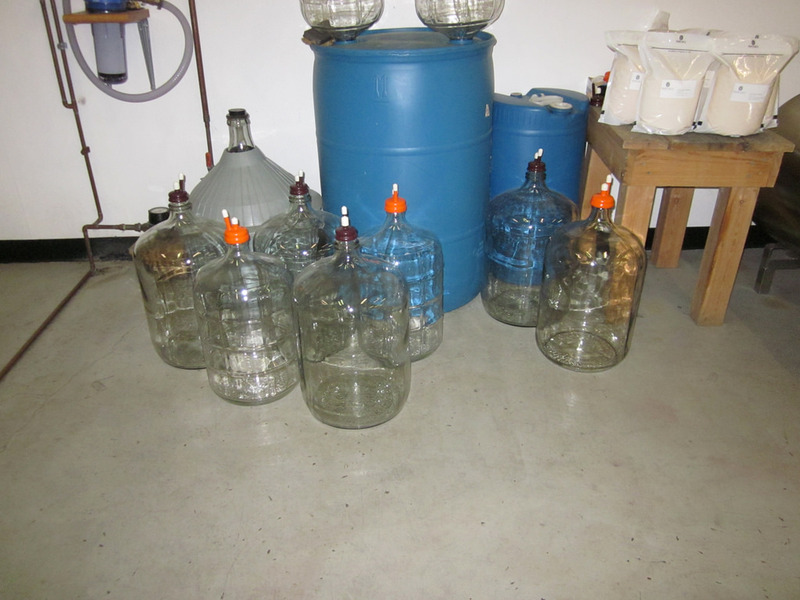 It goes something like this: “Yuck, yuck, yuck, yuck, maybe, maybe, yum!” The Yucks (the heads and tails) will get discarded, and the narrow band of Yum (hearts) is collected and will be distilled again, and perhaps even a third time, before the final spirits are produced. Out of about 60 gallons of mash, you’ll get maybe 10-15 gallons on the first, or “stripping,” run. You get to keep a little more out of the “finishing” or second run, which will subsequently be a higher proof. Some products rest or age at this point; resting can last as short as a week, but can sometimes take years. Sonja showed me wooden barrels of whiskey and rum aging on shelves, and told me that they did a single malt for St. Patrick’s Day this year. These wooden barrels contain aging whiskey and rum. Then you must use water to bring the product to the exact approved proof for sale. For instance, vodka is about 60 percent water and about 40 percent alcohol, which gives you 80 proof. The gins are distilled a total of three times, with the flavoring herbs added on the last run. The final spirits are filtered, then bottled, corked, and labeled by hand. Finally, they are sealed, packed, and shipped. And the owners add a personal touch: “Derek still signs each bottle,” Sonja said. Today, NSD has two full-time and six part-time employees, in addition to the Kassebaums. The company is growing. In fact, they regularly get calls from distributors to expand their sales area and offers to partner with other businesses. “It’s nice to be asked, but we don’t want to bite off more than we can chew,” Sonja said. “We want to make sure Chicago folks can find us, that we’re solid in our region. We ship to six states in the Midwest. 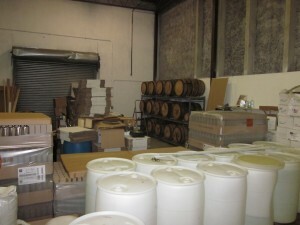 Many distilleries are larger, but we’re a mom-and-pop shop. We’re not quite at capacity but we’re close.” Are they thinking about expanding down the road? “We’re considering a second stripping still, a bit bigger, someday,” she said. Meet Thing One and Thing Two, NSD’s storage tanks, and Fillmore, the filling machine. “(Haigh) picks drinks that are good and surprising,” Sonja continued. “I made all of them. He tells you why and how and what he likes. It’s a whole other world!” Her delight with the art and craft of cocktails is infectious, and she loves to share her knowledge freely. 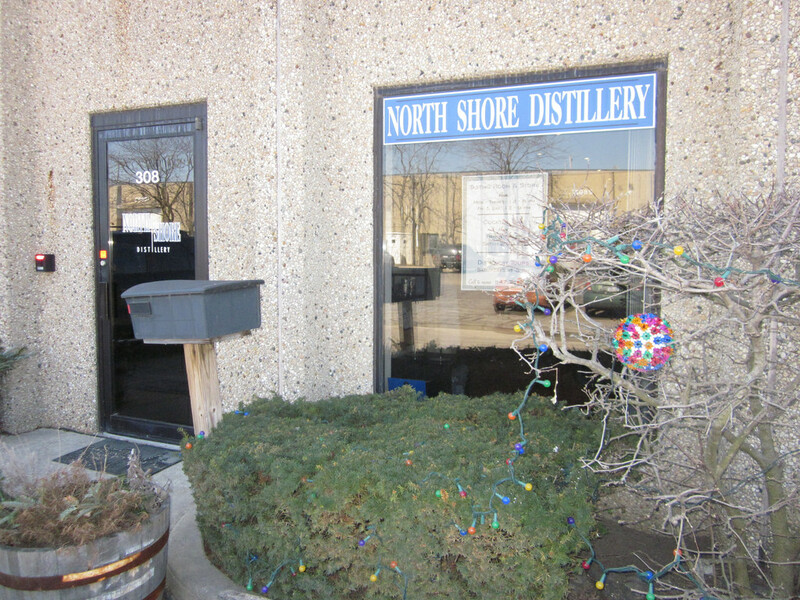 One way to keep up with her is to sign up for the North Shore Distillery’s newsletter and to follow her blog, Thinking of Drinking, which is due to relaunch with a brand new website this year. Sonja explained, ”I play with what we have, or I make a challenge: what about maple syrup and absinthe? I love Chartreuse, in a cocktail called The Last Word (equal amounts of gin, green Chartreuse, maraschino liqueur, and lime juice, shaken with ice). How about a Bloody Mary or an Old Fashioned made with aquavit? 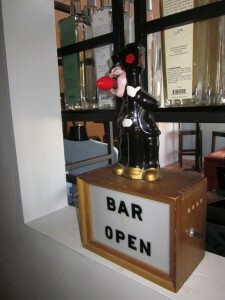 I love a good Negroni (one part each gin, vermouth rosso, and Campari bitters).” Her latest offering in the tasting room is NSD’s Tahitian Vanilla Vodka with honey tangerine juice, which sounds like the ultimate Creamsicle to me. 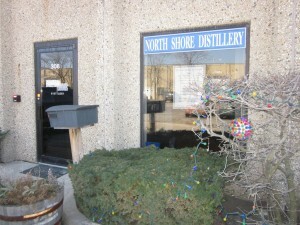 North Shore Distillery is open for tasting and sales Monday-Thursday, noon-6 p.m., and Friday-Saturday noon-9 p.m. 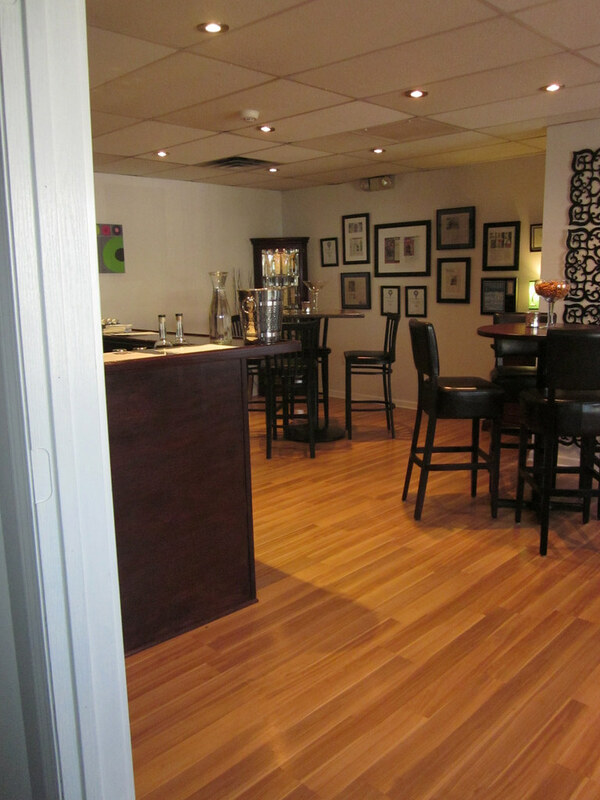 The cocktail bar hours are Friday, 4-9 p.m. and Saturday, noon-9 p.m. Distillery tours are at 3 p.m. on Saturdays ($10 per person includes tastings; reservations are recommended). 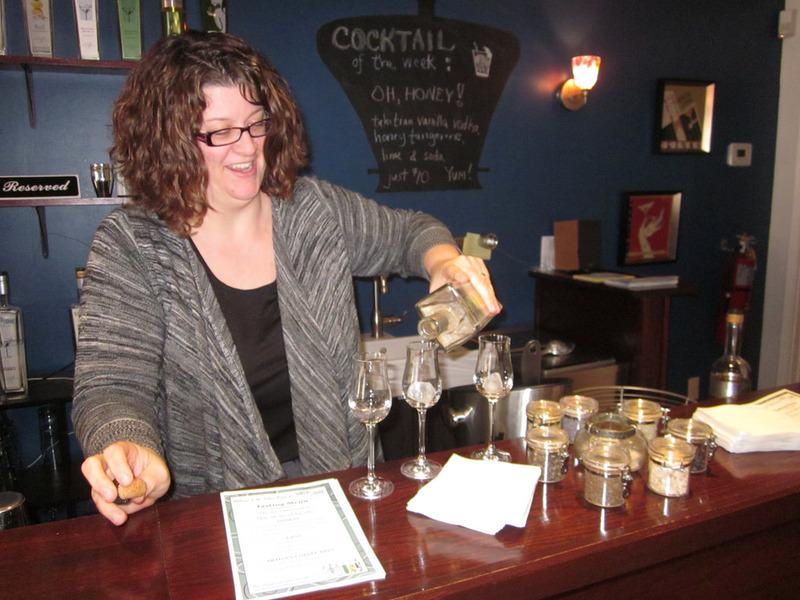 On May 10 from 5-9 p.m., North Shore Distillery hosts its 1st Annual Artisan Producer Festival. Jo Snow Syrups, Hansa Coffee Roasters, Katherine Anne Confections and STILL – Spirited Bath & Body Care will be on hand to show off their wares and provide samples. Katje Sabin (mamagotcha) fondly remembers Sunday mornings with her father, making pancakes and watching Dame Julia make it look easy. She’s still not sure what she’s going to be when she grows up. She lives with her family in Norwood Park, where she cooks ALL the things!